Following you will find a tutorial to re-create your own Argyle Goose card, as pictured above. We always need masculine cards, and this one, featuring the great goose from Wetlands, fits the bill perfectly. Fold a 5 1/2" x 8 1/2" sheet of Chocolate Chip cardstock in half, creasing it well with a bone folder. Run a 3 3/4" x 5" piece of Chocolate Chip cardstock through the Big Shot inside the Boho Chic Embossing Folder. Adhere this to a 4" x 5 1/4" piece of Naturals Ivory cardstock. Wrap a piece of 1 1/4" wide striped ribbon around this piece, securing the ends on the back with Scotch Tape. Attach it to the card front. 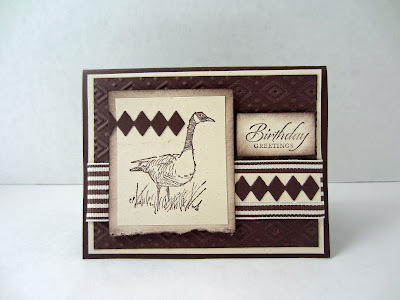 In Chocolate Chip ink, stamp the goose image onto a piece of Naturals Ivory cardstock that measures 2 3/8" x 2 3/4". Tear one of the short ends off of a 2 3/4" x 3 1/4" piece of Naturals Ivory cardstock. Sponge all the edges, including the torn edge, in Chocolate Chip ink. Adhere the goose piece to this. Add a strip of brown diecut diamonds toward the upper left. Adhere a 1/2" x 2" piece of Naturals Ivory cardstock onto the ribbon, leaving a small margin on the right. Add a strip of diecut brown diamonds to the top. Adhere the finished goose piece to the card front with Stampin' Dimensionals, covering the ends of the diamond/cream piece. In Chocolate Chip ink, stamp "Birthday Greetings" onto a 1" x 1 3/4" piece of Naturals Ivory cardstock. To bring the card together, sponge the edges of this piece also. Attach the sentiment to the front with two Stampin' Dimensionals. NOTE: I'd like to say a little something about the Naturals Ivory and Naturals White cardstock that I call for quite often in my tutorials. I MISS THEM! If you are like me, you stocked up on these basic papers for future use as soon as you heard they were going away. There is no other cardstock in the Stampin' Up! line that gives the rugged masculine feel that is the only suitable look for certain cards and projects. What a great card. I love the goose. I wish they'd kept the natural too.